Chart your course to Ocracoke for the Annual Blackbeard’s Pirate Jamboree. Come celebrate Ocracoke’s unique piratical heritage with a weekend of swashbuckling fun! 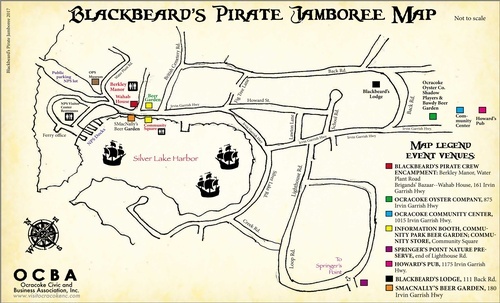 The Jamboree features an historically-accurate pirate encampment, and a reenactment of the infamous pirate Blackbeard’s last battle at Ocracoke. Three ships will re-create the last hours of Blackbeard and his crew as Lt. Robert Maynard brings them to battle with cannons blazing. Get in touch with your inner pirate and wear your best buccaneer gear. Interactive living history exhibits, sea chanteys, music and a shopping marketplace of seafaring fine arts and wares provide entertainment for all ages. The event culminates when pirate and militia crews march to beautiful Springer’s Point to honor those killed in Blackbeard’s last battle with a eulogy, hymns and final cannon salute.